Meet Ned, he left the sea to pursue a quieter life filled with warm drinks and good company. Ned never fancied seawater. He prefers hot tea, a quiet afternoon, and a good book. You can join him thanks to JoAnn Stratakos, our friend and imaginative ceramist. 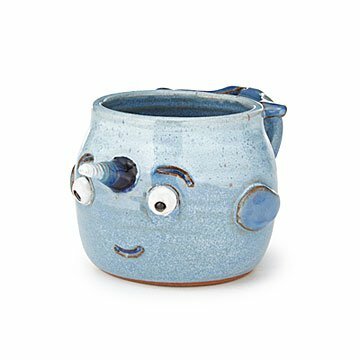 She crafts this chubby little mug from clay, adding sweet details like his signature tusk and tail handle. Finished with an ocean blue glaze, Ned makes a great gift for beach lovers or anyone who treasures enchanted things. Handmade in Effort, Pennsylvania. Love the style of this mug, it's super cute. Friends who I sent it to commented that the tusk is super pokey and they wish it wasn't so large - but generally love everything about it otherwise. Would absolutely buy again from this seller, super unique and high quality. I bought it for a co-worker. She enjoys it a lot. It seems quite durable. I don't know any problems with it. This is a well-made, hand crafted mug! Couple that with the whimsy of the face of the narwhal and its a definite go to gift!